186. 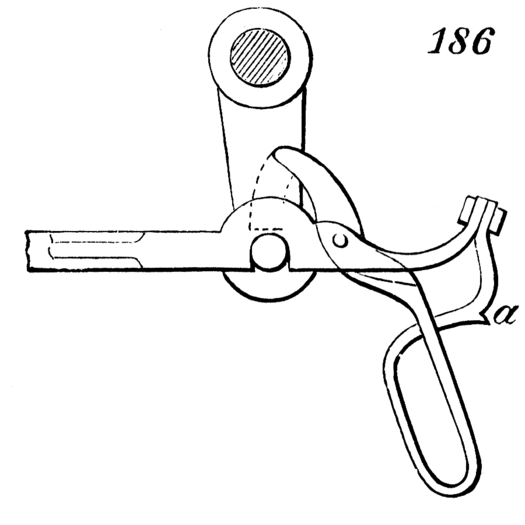 Apparatus for disengaging the eccentric-rod from the valve-gear. By pulling up the spring handle below until it catches in the notch, a, the pin is disengaged from the gab in the eccentric-rod. In an earlier edition of this site, we changed “gab” to “gap” believing that Brown had made a typographical error. Since then we have learned that “gab” is a term for the notch in this type of mechanism. The lever having the pin engaging the gab is called a “gab-lever.” We apologize for any confusion this may have caused.